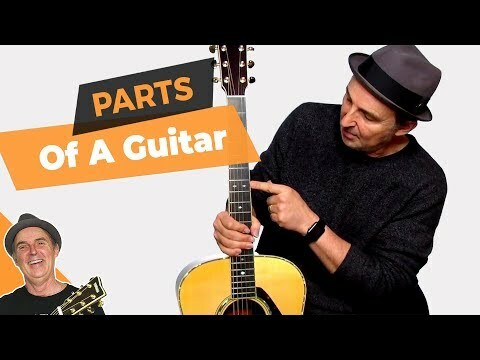 In Lesson #2 you'll learn the names of the different parts of a guitar, also known as guitar anatomy. This is important to understanding all guitar tutorials. Let us begin with the Acoustic Guitar which is also popularly called a Dreadnaught. Other names for this type of guitar is Folk Guitar and Steel String guitar. First we'll divide the guitar into two parts. The entire upper part, the long section that sticks out of the guitar body, is called the neck of the guitar. The neck has at the very top the headstock. On the face of the neck (where you place your fingers) is the fretboard. Now let's break down this entire section into smaller parts. Starting at the the top-most part of the guitar neck is the headstock. The headstock is the home of the the tuning keys. As the name suggests these are the mechanisms that enables you to tune the guitar. There are six tuning keys and six strings... one key for each string. The tuning keys, also often referred to as "machine heads" by people who play electric guitars, help to tighten or loosen the strings depending on the direction you turn them. This is the action that "tunes" them. When the strings are tightened the pitch of the string goes higher. When they're loosened the pitch is lowered. Just below the headstock is the nut. The nut is the little white section between the headstock and at the top of the fretboard on which the strings sits. Nuts are usually made of bone, plastic or synthetic material… or even graphite. There are six notches in the nut where the strings lay before traveling down over the fretboard and body of the guitar. The fretboard is the wood that is on the surface of the neck where you press your fingers. The fretboard has metal frets on it. Knowing the numbering of the frets is one of the more important parts of a guitar because it's referred to often in guitar tutorials. Frets are numbered as the first one (1st), the second (2nd) and so on. This is important because in the course of the lessons I will be instructing you to place your finger on a particular fret. The fret markers are dots on the side of the guitar neck and the face of the fretboard that tells you at a glance where certain frets are. It's common for them to mark the 5th, 7th, 9th and 12th frets (sometimes the 3rd fret also). They can range from simple dots to elaborate decorations that add to the beauty of the guitar. Most nylon stringed guitars, such as classical and flamenco guitars, do not have this (I'm not sure why). This is one of the parts of a guitar that is usually on an acoustic guitar, but not on the classical guitar. The pick guard is made of plastic and usually butts up close to the sound hole. It's there to protect the face of the guitar against scratching from the wild flailing slashes of your guitar pick. Side note: I did actually put one on my Flamenco guitar because of the way I strum. I would likely scratch the face of the guitar with my nails. Just like it sounds (no pun intended) this is the large hole in the center of the guitar body where the sound projects from. The basic mechanics goes something like this: You pluck a string (or many strings) and they vibrate. As the strings vibrate they vibrate the top of the guitar. This vibration bounces around inside the guitar where it's amplified and colored. I guess we could say that's where it becomes sound. It's then projected through the sound hole to be heard by everyone listening. Okay... it's terribly simplified physics lesson. But you get the idea. The sound hole usually has a decoration around it called the rosette. While some rosettes are very fanciful, others come in basic designs. That leads us to the next part below the sound hole. The bridge is below the sound hole. Usually made of wood it's the home of the saddle and the bridge pins. This is where the other end of the strings go to make connection with the guitar body. Within the bridge a little white thin strip on which the strings sit called the saddle. The strings are attached to the guitar by bridge pins. The bridge pins hold the string going down the hole. 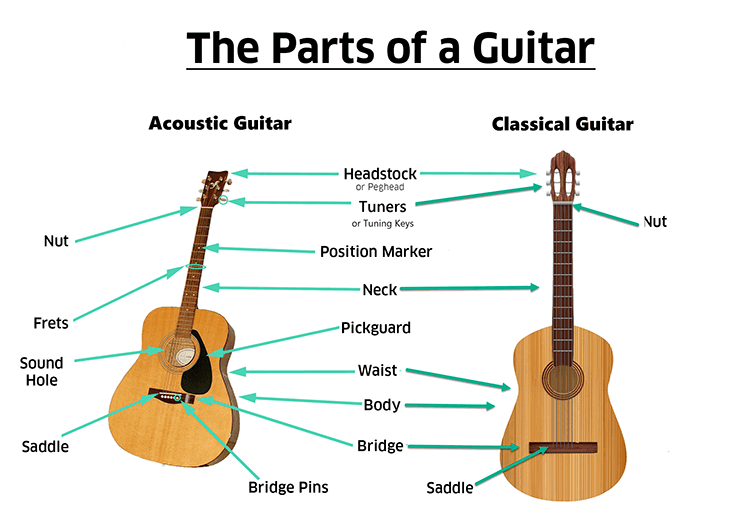 Remember the rather crude explanation of how the guitar makes sound? Well... here's where the strings make contact with the body of the guitar to get this whole thing going. We'll need some way to hold up the guitar... especially when we stand up. A guitar strap will do the job, but we need some place to attach the strap. That's where the strap button comes in handy. Usually at the bottom of the guitar, this is where you attach the strap. The strap has a little hole, and the strap is placed over the strap button. But what about the other end of the strap? The opposite side of the strap is usually attached (tied) to the headstock of the guitar. You can use a string that slips between the strings and the headstock just above the nut. Sometimes I use a shoelace. You can also tie it using a neat little device made by the company Planet Waves called the Acoustic Guitar Quick-Release System. It's kind of like two shoelaces with a clip holding them together. You tie one end on the guitar and the other end to your strap. Then when you want to take your strap off, instead of untying the shoelaces you just unclip it. No need untie it every time. Easy peasy. On some guitars you'll find a strap button attached to the heel of the guitar where the neck attaches to the body. That means you would attach one end of the strap there instead of by the headstock. A lot of guitars don’t, so there is nothing to worry about if your guitar doesn’t have this. The nylon stringed guitar is most commonly referred to as a classical guitar. One of the most obvious differences that most people notice is that the turning keys look different. They are a slightly different mechanism that gets the nylon strings tied onto the rollers. Other than that they work the same way. Just like the steel stringed acoustic you have a neck with the fretboard and frets. It has a slightly different body shape that works better for nylon strings. A well designed classical guitar usually comes with fancier rosette. We also have the bridge. Another difference is there are no bridge pins. Oh no... you say. How can we keep the strings on the guitar. Don't fret (pun intended). It's tradition to tie the strings onto the bridge just behind the saddle. There are little holes just for this purpose. Tied properly in neat little rows it's a work of art. Can you tell I take pride in how I tie my strings on? Although some strings have little balls on them to avoid tying, most classical guitar players wouldn't use them. Nice try though. Joking aside... tying strings on the guitar may seem like a hassle, but you get used to it and it becomes routine. My guitar in the video is a Flamenco Guitar. It looks like what most people refer to as the Classical Guitar and has all the same parts of a guitar. They look very similar, and you may be unable to tell the difference by just glancing at them. Although there are some subtle differences, it may not be relevant to this lesson. Most guitars like this don’t have a strap button. Mine does have a strap button because it has a built in pickup, and there is a button where you plug in a chord that goes to my amplifier. My style of playing demands amplification. In our next lesson you'll learn the names of the strings and some other numbering systems that will come handy as we go through the lessons. I see this is going to be fun. Have not played in 20 years and not will. Have a hard time getting my left hand and right hand to go where they’re supposed to all the same time, and then my fingers got sore then I didn’t want to play and I can imagine what you thinking, why didn’t I keep going because my fingers hurt and I don’t want to hurt my fingers so that’s my story well but your lessons so far have sounded great. Thanks you sir.i want to improve my skill basic to advance .I love guitar music.